Generosity. 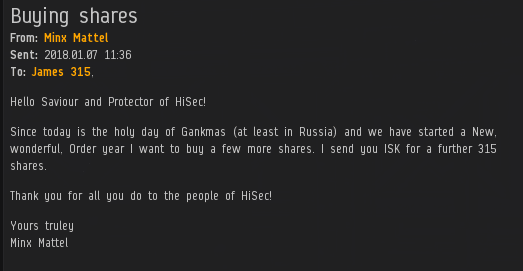 For others, for all highsec. That's the New Order way. 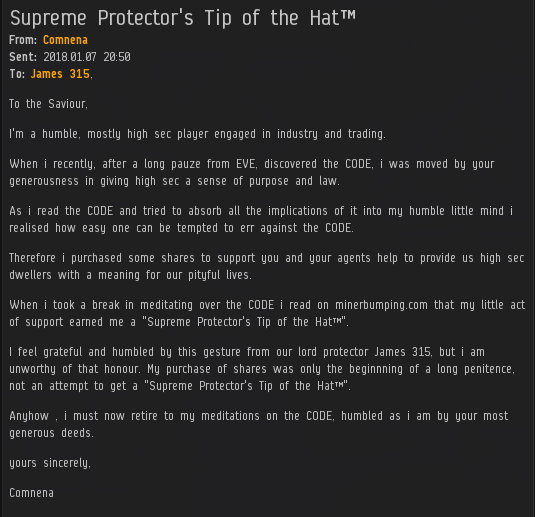 Minx Mattel did her part with a purchase of 315 additional shares, which took us past the 1,569 billion isk mark and earned her a Supreme Protector's Tip of the Hat™. Whether you go by the Julian calendar or the Gregorian, every day belongs to the Code. There you have it: Indisputable proof that our Agents are helpful. Agent Liek DarZ has helped so many people test their tanks, you wouldn't believe it. Nicholas Simon's corp, Bi-Polar Tendencies, joined the ranks of highsec's responsible corporate shareholders with a purchase of 1,000 shares. 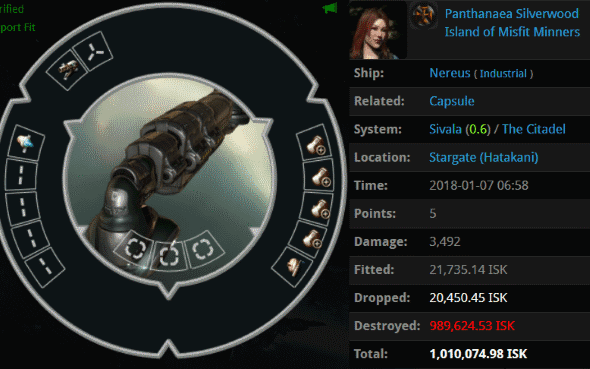 This act took us past the 1,570 billion isk mark and earned the corp a Supreme Protector's Tip of the Hat™. Very well. But let me give you a little advice: Never pass up a Supreme Protector's Tip of the Hat™. The recently returned Panthanaea Silverwood thought she'd give EVE another go, and she streamed her experiences. That's great! EVE needs more publicity right now, especially since nullsec isn't generating the big, epic stories of yesteryear. However, Panthanaea failed to obey the Code. 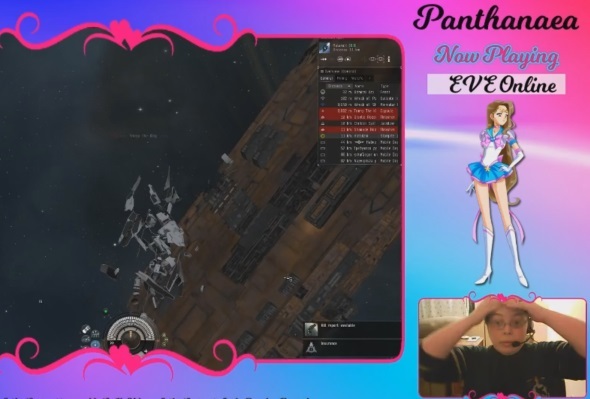 Now it was up to our Agents to make sure her stream advertised what happens to people who play EVE with such recklessness. Before long, the streamer's own broadcast was repurposed to show the New Order's message. A clip of the gank was duly recorded. I'm pretty sure highsec is better off without such ships. In fact, I know it is. Agents Trump The King, Giselle Rozei, and Shanade Rozei did EVE proud. EVE Online needs publicity--but only the right kind of publicity. Ours. Panthanaea should have bought a permit and followed the code before streaming. Silly girl. Trying to PVP with The Conference Elite using a Nereus – what was she thinking? Jamey getting rich while his CHODE. slaves do all the terrorizing. Nb4 ehnemea shows up using falsehoods and bad advice in a poorly disguised attempt to clickbait visits to her ghetto alpha blog. Nothing wrong with the GHETTO bro.